Book buyers and book hunters (who tend to be one and the same) are funny about bibliographies. Non-fiction books need to have them, they’re great to skim through to locate more books on favorite topics – but they’re not exactly scintillating reading. 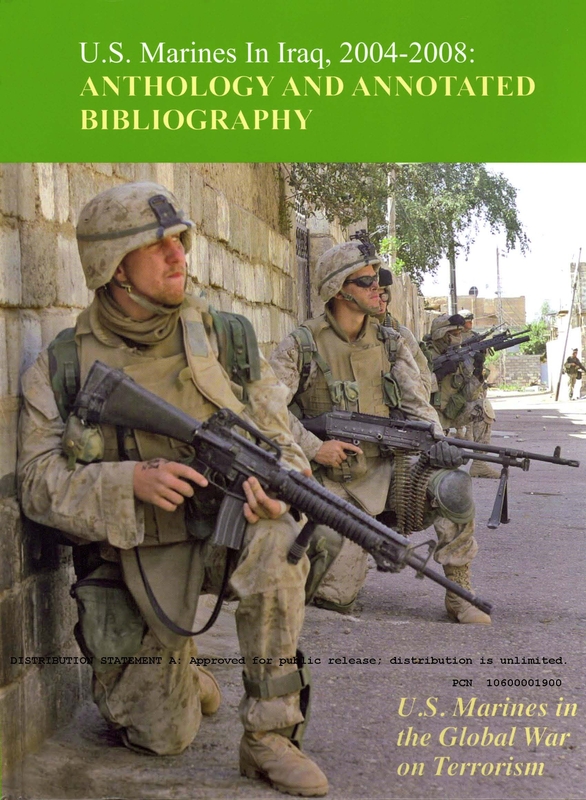 When I saw that the title of this 2011 Library Journal notable Government document was U.S. Marines in Iraq, 2004-2008: An Anthology and Annotated Bibliography, I had mixed feelings. What percentage was going to be anthology as opposed to bibliography? It really wasn’t a problem. Most of the book is anthology – and not just selections from the Marine Corps Gazette, although there are some excellent ones from that estimable publication. It also includes articles from such distinctly non-military sources as Vanity Fair and Foreign Affairs, and they’re not always totally favorable. Coverage of controversies such as the killings of civilians at Haditha and blunt discussions of whether the American course of action in Iraq was selfless or madness make this collection a lot more than just a “how-to” guide to irregular warfare or IEDs (improvised explosive devices). The U.S. Marines might not love everything journalists and experts write about them, but they’re willing to address criticism, not just ignore it – and I liked this open-mindedness. As a bonus, each article begins with a striking color photograph of Marines in their varied roles inIraq, from combat to pacification. The bibliography, as the title says, is annotated, so it’s a handy guide to the mainly periodical literature covering these crucial four years of U.S.intervention in Iraq and undoubtedly will be useful to scholars and soldiers alike. U.S.Marines in Iraq, 2004-2008 is a fine book for readers and bibliography-philes alike. You can find it here or in a library. This entry was posted on Wednesday, July 6th, 2011 at 12:16 pm and is filed under U.S. Marines, U.S. Navy. You can follow any responses to this entry through the RSS 2.0 feed. You can leave a response, or trackback from your own site.